Our 4 guest rooms are waiting for you, where the old-style parquet and the ubiquitous pine wood create a warm and cosy atmosphere. 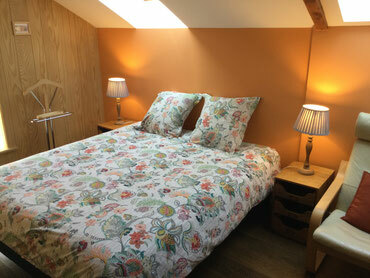 Each room is fitted with an ensuite private bathroom including a shower and a teak wooden floor, as well as separate toilets. 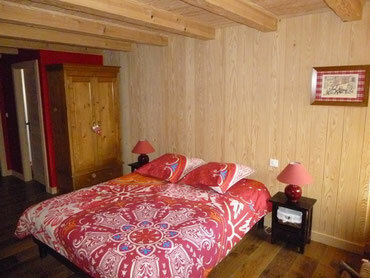 A 18m2 (194 sq ft) double room with exposed wooden beams, a distinctive Alsatian atmosphere and romantic shades. 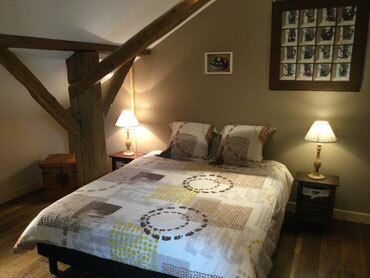 It features a 160x200 queen size bed. 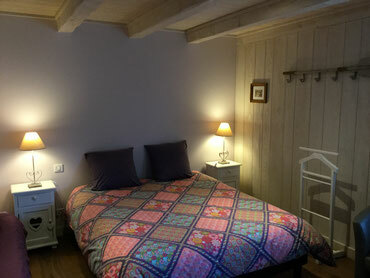 Mauve and purple shades, whitened beams and a soothing atmosphere for this room overlooking our orchard. With its 20 m2 (215 sq ft), its 160x200 queen size bed and its 2 bunk beds, it will perfectly suit a small family. Chocolate comes in many versions, therefore in this family room you will be surrounded by a variety of its colours. This comfortable 40 m2 (430 sq ft) family room features a main bedroom with a 160x200 queen size bed, an alcove overlooking the orchard, and a separate bedroom with 2 single 90x190 single beds.